With connection label, easy to install and operate. Can reverse the motor&apos;s direction(CW/CCW) through potentiometer knob. Accuracy circuit design, high efficiency, high torque and high power. Adjustable and wide speed range(0~100%). 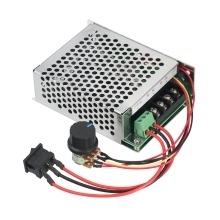 Equipped with outer shell to protect the controller board from damage as well as dissipate heat.